The Nelson Atomic Gardening Society and The Refinery ArtSpace present an experimental event in an effort to raise funds for reduced gallery hire fees for our exhibiting artists. All ticket sales will support this aim, valuing the importance of art being an essential ingredient for our wellbeing and the community we serve. With buying a ticket we would like you to email a recording of a recollection, in form of a voice memo, of an actual personal memory from any year between 1977 and 2012. We appreciate your participation, these recordings will be used during countdown and at the launch, closing event. The event will commemorate the launch of Voyager 1 in 1977 and leaving the solar system into interstellar space in 2012. 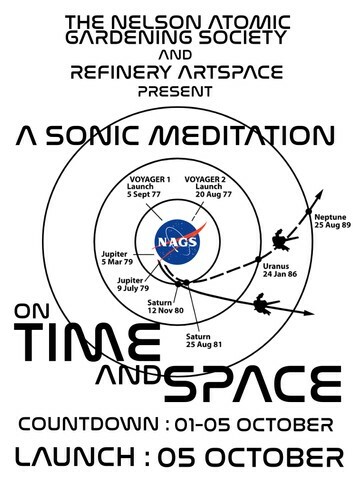 During the Countdown (1 – 5 October, gallery opening hours) to our launch October 5, 7 – 9pm, random artefacts that reflect our optimistic 70’s space frontiers a modular generative path will slowly evolve, with minimal Interferences from human intent, allowing the freedom of analog illogical expression and semi-random sound collages to happen. Some tickets will be available at reception during countdown and we encourage visitors to record recollections at the venue during that time. We would like to encourage people who bought tickets to dress to a chosen decade between 1977 to 2012. Let us surprise you at the launch – an experiment with intent but with random events being unavoidable. Please note that part of the event/experience will contain bright and flashing lights and may potentially trigger seizures for people with photosensitive conditions. Warning signs will be in place where relevant.